In one moment the Norns changed the pattern they were weaving in the fabric of my fate. It was a late afternoon, and I was working down by the shore, beside the boathouses. All that day I’d been squaring logs into timbers, and my back and shoulders were weary from swinging the heavy broadaxe. I didn’t mind the labor itself, for though I was but fourteen, I was as tall and strong as many grown men. And I enjoyed working with wood – since I was very young, my hands had possessed an unusual skill to create with both wood and metal, a gift that had saved me from much harder work in the fields. I minded, though, that always my efforts were for someone else. I minded that I lived only to serve the needs and obey the orders of others, because they were the masters and I was a slave. As it often did, my mind wandered as I worked, and I dreamed I was free, and a warrior. I had no right to harbor such dreams, for I had lived my whole life as a slave and by rights was doomed to die as one. Yet dream I did, for my dreams allowed me to escape the reality of my life. With each stroke of the broadaxe I imagined I fought against the English, standing shoulder to shoulder in a shield wall with other warriors, other free men. Hrorik, the chieftain who owned me, and the man who had sired me, was in England raiding even now. Most of the free men of his estate and of the nearby village were there with him. If I was free, I told myself, I could be there too. My mother came down to the shore and sat, wordless, on the slope above where I worked. When her duties permitted, which was not often, she liked to come and quietly sit and watch me at my labors. It embarrassed me for her to watch me so. It made me feel like a child, and once I spoke angrily to her over it. “I am sorry, Halfdan,” she’d said. “It gives me pleasure to watch my son at work. But if it distresses you I will stop.” After that I said nothing more to her about it, for there’s little enough that’s pleasing in a thrall’s life. I loved my mother, and would not take from her what scraps of pleasure she could find. 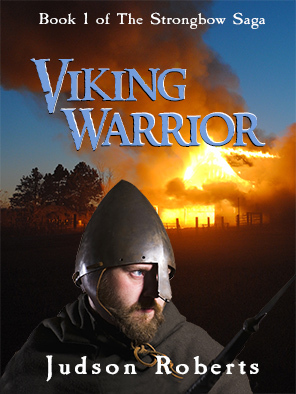 After a time Gunhild, the wife of Hrorik, my father, stormed down from the longhouse and chided Mother. My mother did not speak to Gunhild, or even acknowledge that she’d heard. I looked up from my work and saw Gunhild’s face was turning dark red with anger. Gunhild was an ill-tempered woman at the best of times, and she hated my mother, because of the lust that Hrorik felt for her, a mere thrall. Her bitterness grew greater each night that her bed was cold and empty because Hrorik left her to lie with my mother. I do not believe Gunhild ever felt love for Hrorik. Theirs was a marriage built on position and wealth rather than feelings of the heart. But Gunhild was a proud woman. No doubt she felt humiliated that all who lived in Hrorik’s great longhouse knew how often he fled her bed for that of a slave. Gunhild stomped back up to the longhouse. I feared her wrath, especially since Hrorik, who sometimes would restrain her, was gone. I wished Mother would return to her chores, and not provoke Gunhild so. But Mother sat silently on the hillside, staring out toward the open sea. A strange silence hung in the air; even the gulls had temporarily ceased their cries. Every breath of breeze died, and the water in the fjord turned as flat and slick as the blade of a fine sword. A short time later Gunhild returned, hurrying with long strides, carrying in her hand a long thin branch that she’d trimmed as a switch. As she neared my mother she raised it high above her head, but before she could strike, Mother stood and pointed out across the water. A longship had pulled into view around the headland of the fjord. Its mast was bare; a sail would have been useless in the still air. The oars raised and lowered rhythmically, beating the surface of the water, dragging the ship forward. People began running from the longhouse and outbuildings down to where Gunhild stood anxiously watching the ship, the switch in her hand now forgotten. Ubbe, the foreman of the estate, whose leg was crippled from an old wound, arrived at a halting run. He carried his sheathed sword in his hand. Turning finally to face Gunhild, my mother spoke, a strange, triumphant look on her face.